For more than 30 years, Laurna Godwin has been using her communications skills to inform and educate people about issues affecting how they live, work and play. She is a three-time Emmy award winning broadcast journalist who today is a partner and co-founder of Vector Communications Corporation, a public engagement and communications consulting firm based in St. Louis, Missouri whose motto is “advancing learning, dialogue and positive change.” Vector helps improve communities, organizations and individuals through engagement and community relations, communications, event planning, media relations, cause-related marketing, video production and board governance. Prior to co-creating Vector in 1998, Laurna spent nearly twenty years as a television news anchor, reporter and talk show host. She worked for: NBC in Virginia; WNET, the flagship public television station in New York City: and KETC and KPLR here in St. Louis. Laurna was also a mid-west reporter for CNN. 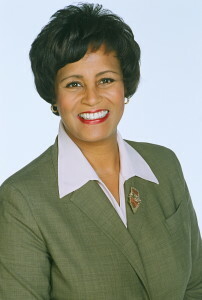 During her professional career, Laurna has received several awards including: the St. Louis NAACP’s “Most Inspiring St. Louisan;” the Federation of Press Women – Missouri affiliate’s Quest Award, which recognizes professional communicators whose work “reflects an enduring quest for the highest standards of professional ethics and excellence;” and several video production awards. The St. Louis Business Journal has named her one of the most influential businesswomen and one of the most influential minority business leaders in the region. In addition to co-owning Vector, Laurna has served on several civic and corporate boards. She recently retired as Board Chair of the Greater St. Louis Community Foundation, which makes the region better by promoting charitable giving. She also serves on the boards of St. Luke’s Hospital, the St. Louis Police Foundation, and Arch Grants, a non-profit organization that provides $50,000 non-equity grants to its winning start-up firms who move to or remain in St. Louis. A native of New Jersey, Laurna earned her undergraduate degree from Princeton University and her master’s degree in journalism from Columbia University in New York City.